Last Saturday I met up with a couple of friends and enjoyed a free cooking demo from Chef Stephanie Izard, past Top Chef winner and current owner of two wildly popular Chicago restaurants. Chef Izard was relaxed, friendly and super skilled. We were served samples of four recipes that she prepared, all based around corn. She made a corn stuffed dumpling that was served with a delicious chive yogurt sauce. I asked her to repeat the recipe for the sauce, so simple, and commented how well it might pair with salmon. Chef Izard agreed and I vowed I would give it a try this week. Well, it was a wild morning in the kitchen when I couldn’t get my Vitamix to properly blend the sauce. My processor got it smooth, but left visible bits of chive in the sauce, unlike Chef’s pale green perfection. I guess that’s why I’m not a Top Chef, but it tasted wonderful and there are leftovers for lunch today. LtC TIP: Allow the poached salmon and the sauce to come closer to room temperature before serving. I let both sit out on the counter for an hour before serving. 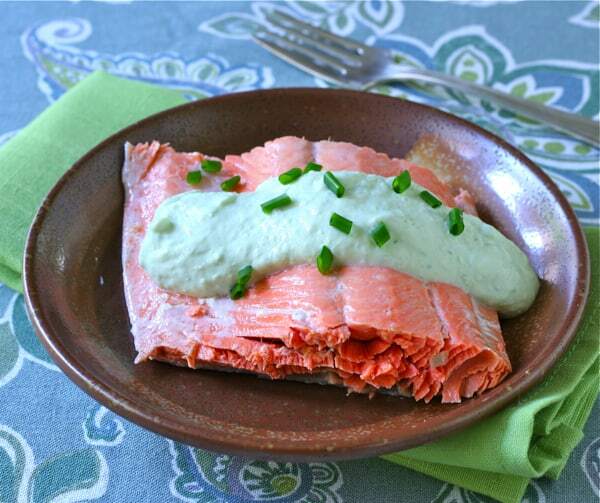 Poached salmon with a simple chive and yogurt sauce. Place the salmon in a fish poacher or large skillet. Add enough water to cover the salmon halfway. Squeeze the lemon over the fish, then add the halves to the water. Sprinkle with salt and cover the skillet. Cook over medium-low heat for about 10 minutes, until the center of the filet is cooked through. Allow the salmon to rest , off the heat, for 10 minutes, then use 2 spatulas to carefully remove the fillet, cool, then refrigerate until serving. To make the sauce, add the chives, yogurt milk and salt to a food processor. Process until smooth. Chill until serving. Cut and serve the salmon, spoon a generous portion of the sauce over each portion, garnish with more chopped chives and serve. This is such a lovely classic, especially with this sauce – one of my all time faves. Thanks, Lynda, it got a thumbs up from Larry a few nights ago. That was such a fun cooking demo! I’m glad to see it inspired you to make this sauce. I can’t find my recipe cards from her demo, phooey! I can’t either, Lisa, but I love this sauce and have tried it with parsley – not as good as the chives and I add more of them than Chef did.